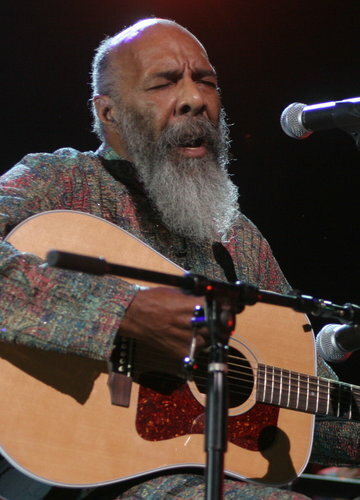 Richie Havens, who marshaled a craggy voice, a percussive guitar and a soulful sensibility to play his way into musical immortality at Woodstock in 1969, improvising the song “Freedom” on the fly, died on Monday at his home in Jersey City. He was 72. Mr. Havens embodied the spirit of the ’60s — espousing peace and love, hanging out in Greenwich Village and playing gigs from the Isle of Wight to the Fillmore (both East and West) to Carnegie Hall. He surfaced only in the mid-1960s, but before the end of the decade many rock musicians were citing him as an influence. His rendition of “Handsome Johnny” became an anti-Vietnam War anthem. He moved beyond his ’60s triumphs to record more than two dozen albums, act in movies, champion environmental education and perform in 1993 at the first inauguration of President Bill Clinton. In 2003, the National Music Council gave him its American Eagle Award for his place in the nation’s musical heritage. Kidney surgery forced him to stop touring last year. Rahav Segev for The New York Times——-Mr. Havens at Madison Square Garden in 2006. For the baby-boomer generation, he will live forever on the stage of the Woodstock festival, which he had the honor to open because the folk-rock band Sweetwater, the scheduled opening act, was stuck in traffic. Mr. Havens and his guitarist and drummer arrived by helicopter. They had been scheduled to go on fifth. Mr. Havens started with “Minstrel From Gault” a few minutes after 5 p.m. on Aug. 15, 1969. He was originally supposed to play four songs, but other performers were late, so he played on. He later said he thought he had played for two hours and 45 minutes, but two bands followed him before sunset, around 8 p.m., so that was impossible. But Mr. Havens played 10 songs, including Beatles songs. His impassioned improvisation was pitch perfect for the generation watching him, most of whom saw it later in a documentary on the festival. His clarion encore “Freedom” — made up on the spot and interspersed with the spiritual “Motherless Child” — sounded a powerful if wistful note. “ ‘Freedom’ came from a totally spontaneous place,” Mr. Havens said. Richard Pierce Havens was born on Jan. 21, 1941, in the Bedford-Stuyvesant section of Brooklyn, where he grew up. He was the eldest of nine children. His father made Formica tables for a living and played piano with various bands. His mother worked for a bookbindery. He began singing with street-corner doo-wop groups when he was about 12. At 14 he joined the McCrea Gospel Singers. He was recruited by a street gang, and he dropped out of high school. He spent the rest of his life educating himself, and was proud of the results. In his late teens Mr. Havens migrated to Greenwich Village, where he wandered the clubs working as a portrait artist. After a few years he discovered folk music, and he was soon playing several engagements a night at clubs like Why Not? and the Fat Black Pussycat. His hands were very large, which made it difficult to play the guitar. He developed an unorthodox tuning so he could play chord patterns not possible with conventional tunings. The style was picked up by other folk and blues singers. In 1971, he released the only single that would put him in the Top 20, a soulful rendition of George Harrison’s “Here Comes the Sun.” His music had a new burst of popularity in the 1980s, and he found success as a jingle writer and performer for Amtrak, Maxwell House Coffee and the cotton industry (“The fabric of our lives”). He acted in a few movies, including “Hearts of Fire” (1987), which starred Bob Dylan. Mr. Havens devoted considerable energy to educating young people on ecological issues. In the mid-1970s he founded the Northwind Undersea Institute, an oceanographic children’s museum on City Island in the Bronx. He later created the Natural Guard, an environmental organization for children, to use hands-on methods to teach about the environment. Carrie Lombardi, Mr. Havens’s publicist, said his family wanted to keep information about survivors private, but she did say that they include three daughters, five grandchildren and two great-grandchildren. He was married many years ago. Mr. Havens played many songs written by Mr. Dylan, and he spent three days learning his epic “A Hard Rain’s A-Gonna Fall.” A man who heard him practicing it stopped him on the stairs as he headed for the dressing room of a nightclub, and told him it was the best he’d ever heard the song sung.